Conditions above 5,000 feet in the western United States are hot and dry. Soil is thin to non-existent in the rocky terrain of Grand Canyon, Arches and Canyonlands National Parks. Yet, vegetation from wild flowers to trees found ways to grow. Blog author standing among Nevada Cedars on the Grand View Point Overlook trail in Canyonlands National Park near Moab, Utah. I was fascinated how trees would grow on the sides of cliffs, in hot desert environments and at the edge of massive rock formations. During a typical year, these trees are subject to intense heat to extreme cold with little rain. When rain does fall, it creates flash flooding and carries soil away with some of the trees living in that soil, too. These trees have learned to get their water from the air as it condenses in the cool nights on leafs and needles. Pinyon Pines were my favorite tree to photograph in the parks. They grew into mangled looking specimens. Which made them photographic to my vision. 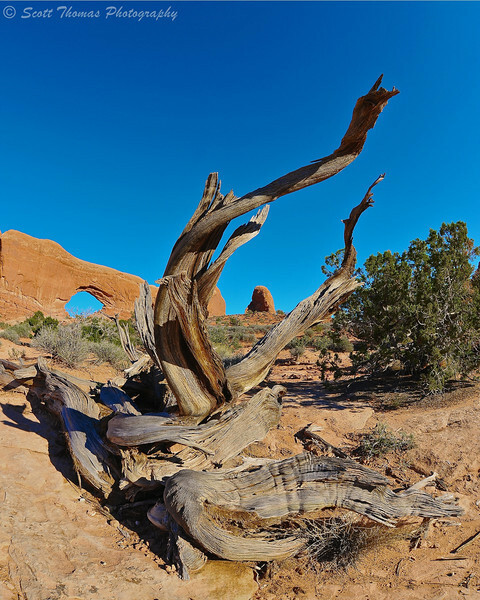 Old Pinyon Pine in front of North Windows Arch in Arches National Park near Moab, Utah. Nikon D700/Sigma 15mm, 1/125s, f/11, ISO 200, EV 0. You can see the kind of soil these trees try to grow in. Yet, they survive even if it is on the wall of the Grand Canyon. 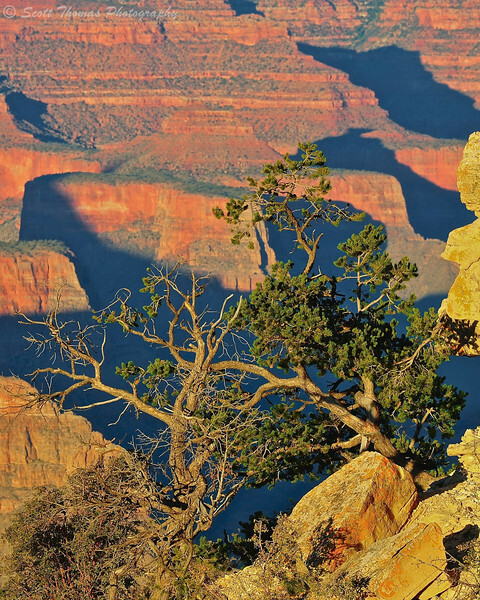 Pinyon Pine tree clings to life at Grand Canyon National Park in Arizona. Nikon D700/28-300VR, 1/125s, f/16, ISO 280, EV -0.3, 250mm focal length. 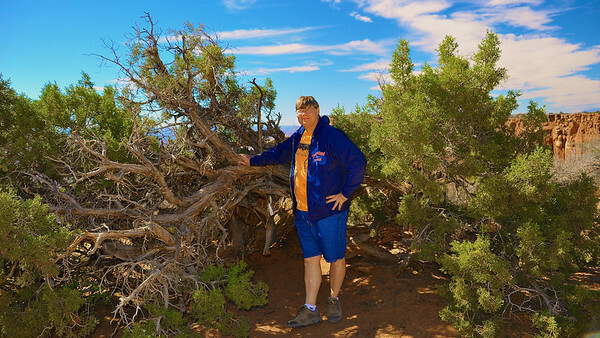 I found this large Pinyon Pine growing in the shadow of Skyline Arch in Arches National Park. The ground was a layer of sand with hard rock underneath. Didn’t seem to phase the trees and brush growing there. Pinyon Pine growing in the shadow Skyline Arch at Arches National Park near Moab, Utah. Nikon D700/28-300VR, f/22, ISO 1000, EV 0, 28mm focal length, tripod, HDR Image. Life finds a way. Which leads me to believe there is life beyond Earth and lots of it. 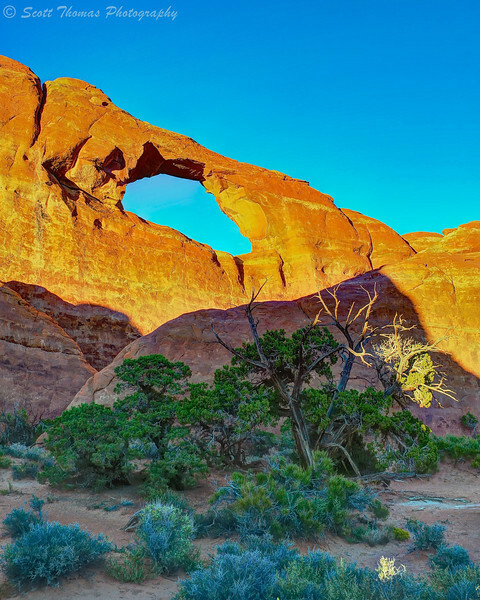 This entry was posted in Weekly View and tagged 28-300mm, arch, arches, arizona, blue, canyonlands, fisheye, grand canyon, moab, national park, nevada cedar, nikon D700, pinyon pine, sigma 15mm, sky, skyline, tree, utah, vr, windows. Bookmark the permalink. “Life finds a way” – nice thought to end this very interesting series of photos. Thank you…they were very interesting trees. Beautiful photos, Scott. You should be recruited to chronicle that life elsewhere as it’s discovered. Sign me up, Mark! BTW, nice review of “About Time”. Will be taking it in this weekend. Love the trees that seem to grow out of rocks – always been fascinating to me too (guess like father, like daughter!) Also, is it bad that the “life finds a way” thought immediately makes me think of Jurassic Park?